"Let's go to Aberdeen Centre", exclaimed my mother-in-law while we were dim summing at Phoenix Garden. Uh... Head to Richmond? And with my mother-in-law??? Oh great, why don't you just strap me to the front of a courtesy car driving down #3 Road will ya? At least it would be a quick death. "We'll do it next week", replied Viv. Fine, at the very least, that meant eats in Richmond and it is usually a tasty proposition. Yes, I do give Richmond a hard time about the driving and parking issues, as well as the general inconsiderateness, but the food keeps luring me back. 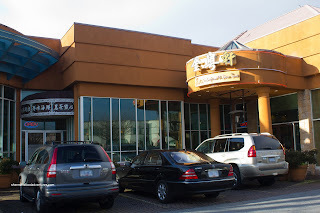 So with that in mind, we headed to Empire Chinese Cuisine in search of Dim Sum. From the looks of the decor, the place looked legit. 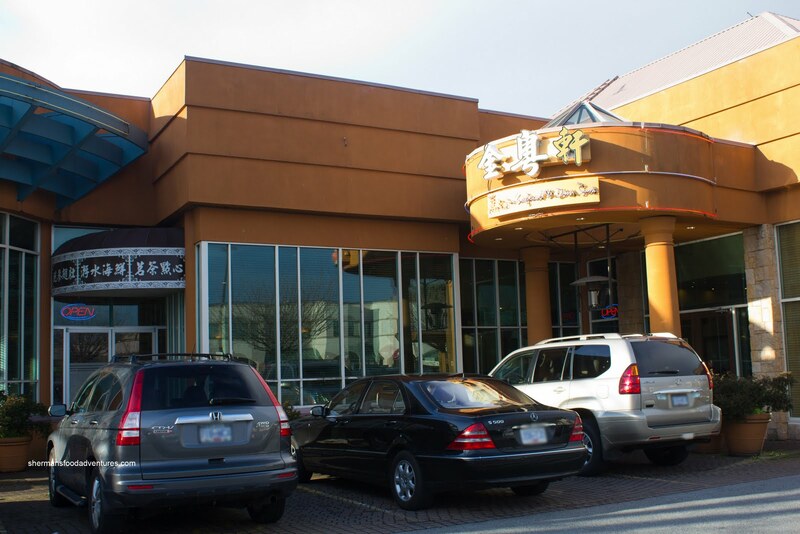 Bustling with activity and full of patrons, we were eager to try the food. It surely started off in fine fashion with the Shredded Chicken and Jellyfish Salad. 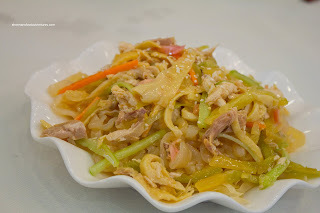 There was a good mix of crunchy jellyfish, tender and slightly gelatinous free-range chicken, pickled vegetable, cucumbers and carrots on a bed of fried wonton strips. I found the seasoning to be spot-on with just the right amount of sesame oil, white pepper and soy. Good balance of flavours and textures, especially the crunch from the veggies. Then the meal started to mostly go downhill from here. The Shrimp Mousse Stuffed Eggplant was plain gross. The shrimp mousse had a mushy, unfresh texture and worst of all, it tasted spoiled. We surmised it was made the day before and it started to degrade. In fact, there was a sourness to it. Very unpleasing. 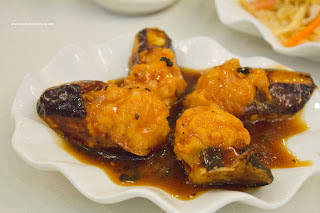 Too bad since the eggplant was fine and the sauce was quite good as well. 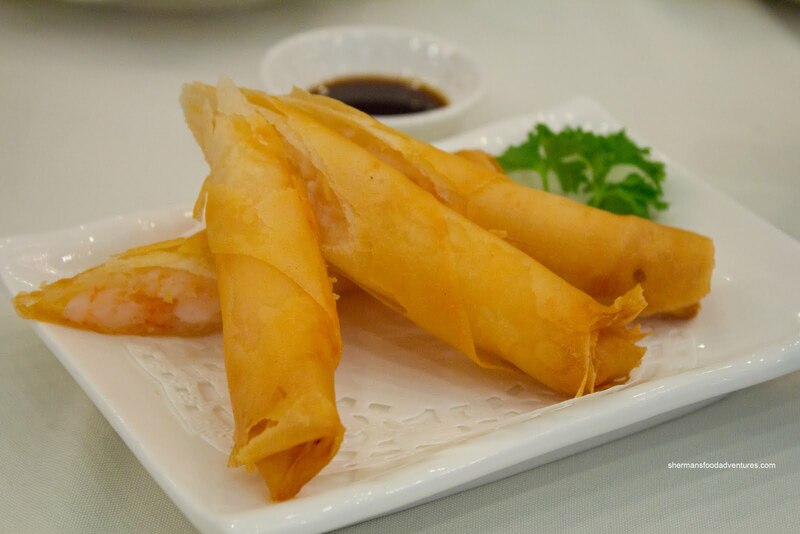 In what we can consider a reprieve from the previous dish, the Shrimp Spring Rolls were pretty good. Nicely plated and aesthetically pleasing, these were crunchy, hot and not greasy. Furthermore, the whole shrimp filling was crunchy and very garlicky. As usual, my son loved it. Well, the fried portion that is... From the good, we go back to the bad with Ja Leun (or Rice Noodle Roll Wrapped Donut). First of all, the donut was sweet. That is not typical for this dish. Considering the accompanying sauces were already sweet (hosin and sweetened soy), that is a double-dose of sugar. Secondly, the donut itself was dense and too crunchy. This was a textural and flavour flop. Then we had one of our favourites - the Black Bean Spareribs. Well, this one in particular was far from being close to what we normally expect in a well-made version. For the prices at Empire, this was a meager offering. Not much in the way of good rib pieces, it was mostly cartilage. In fact, we had quite a few rib ends which were not tender at all. Either it was an unlucky grab of pieces or they didn't use very good ribs to make this. In terms of flavour, there was not much. Despite the peppers and garlic on top, the ribs were bland. Furthermore, they used too much starch in the marinade, hence there was this film on the meat which was gooey and unappetizing. 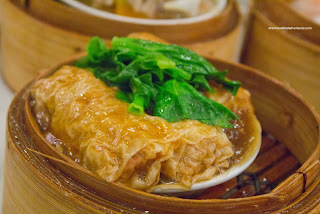 Another one of my personal favourites is the Bean Curd Skin Roll. This usually consists of pork and sometimes mushrooms, shrimp and bamboo shoots wrapped in fried bean curd skin and steamed with an oyster flavour based sauce. This was pretty much how it was prepared except for one thing. The sauce was so thick, I could pick it up with my chopsticks. No joke! When one can do that, there are serious problems with the sauce. Obviously, they put far too much starch in it and even after some steaming, it still didn't dilute. The worst thing of all was that it didn't even have much flavour. As for the roll itself, it wasn't too bad though. The pork filling had texture while still being tender and there was a good amount of shrimp as well. 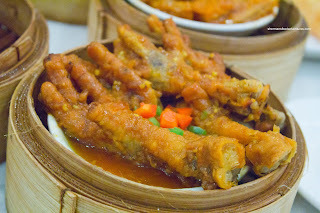 Without even commenting on the Chicken Feet, it is clear from the picture that some pieces were falling apart. Despite this, the texture was still okay. The feet weren't overfried, thus, there was still a good amount of gelatin underneath. I think that they did only a light fry on the feet which would explain the moistness of the skin and gelatin. Once again, despite the appearance of pepper and garlic, the predominant taste was of sweetness and little else. Seemingly with the same sauce, the Tripe & Tendons were quite sweet as well. It wasn't like the dish didn't taste good, but when every bite is one-note, it gets a bit uninteresting. Yet, the worst thing about it was the textures. 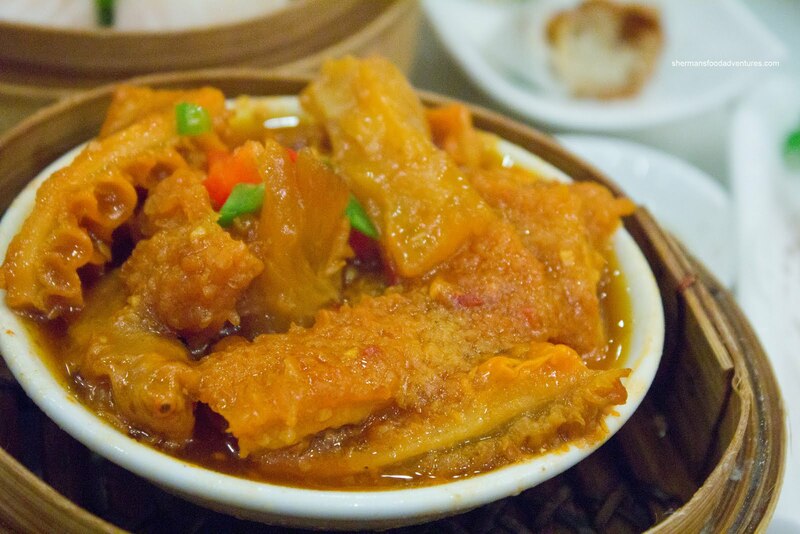 Normally, tripe and tendons need to be cooked until tender because the raw product is tough. In this case, they must've cooked it too long because it was melt-in-our-mouths soft. Of course soft is a whole lot better than chewy, but there was hardly any chew at all. Unfortunately another fail. 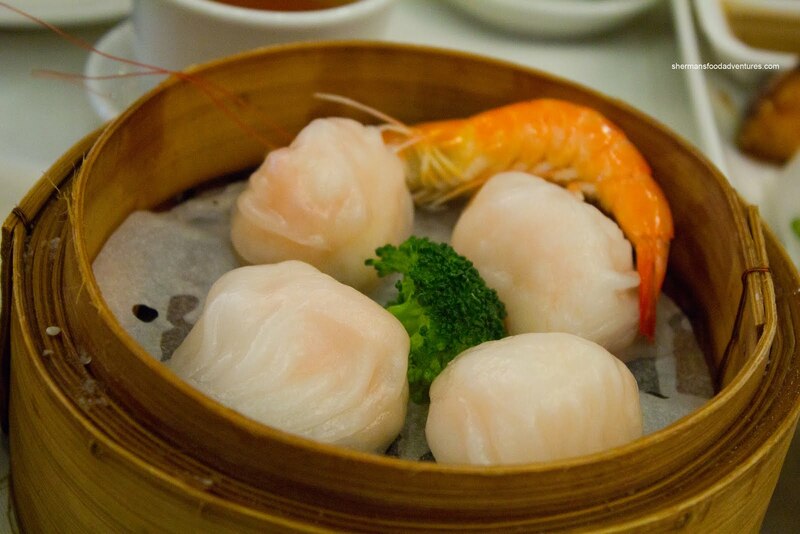 Arriving with a whole white shrimp, the Haw Gow (Steamed Shrimp Dumplings) were some of the smallest ones we've seen in the GVRD. Of course size is one thing, taste is another. Overall, the haw gow were decent with crunchy whole shrimp (a touch heavy on the sesame oil) and an okay dumpling skin. It was slightly on the thicker side though. In the end, we couldn't get over the cost-to-size ratio. 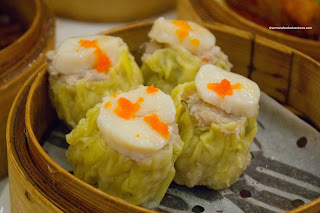 Of course we also got the Sui Mai (in this case it was a Scallop Sui Mai) to go with the haw gow. Oh man, we didn't like these, I don't even know where to start... First of all, the scallop on top was woefully overcooked, chewy and didn't taste fresh (well, of course it was frozen, so it was too be expected). Then, the pork filling was chopped up in such big pieces and not properly tenderized. 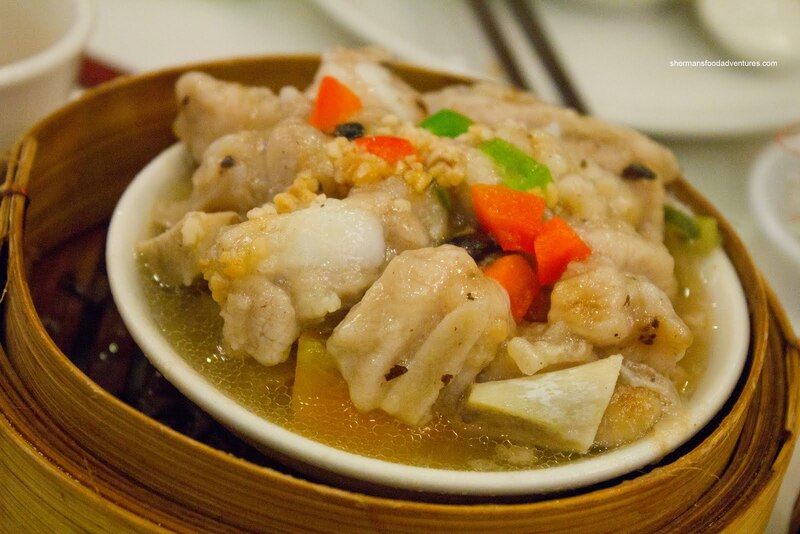 Moreover, there was not enough pork fat to moisten the dumpling. Hence, it was chewy and kind of hard to eat. Then, worst of all, the whole thing didn't have much in the way of seasoning. All I could taste was pork flavour and unfresh scallops. Not appealing at all. 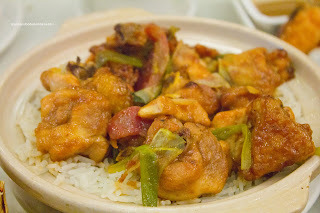 Moving along, we had the Steamed Free Range Chicken Rice. By virtue of being steamed and not baked, the rice didn't exhibit that dry nuttiness which we come to expect from a clay pot. Despite this, the rice was still chewy and not mushy. The free-range chicken was actually quite meaty and moist. There was a decent amount of Chinese sausage, green onion, ginger and soy flavour since the chicken was wok-fried first before being placed atop the rice. This also acted as a negative though because the rice became quite oily due to the residual grease from wok-frying the chicken first. Due to its meager size, we didn't think it was worth $7.95. After this, there was a pleasant surprise. The Egg Tarts arrived and that was our last dish of the meal. 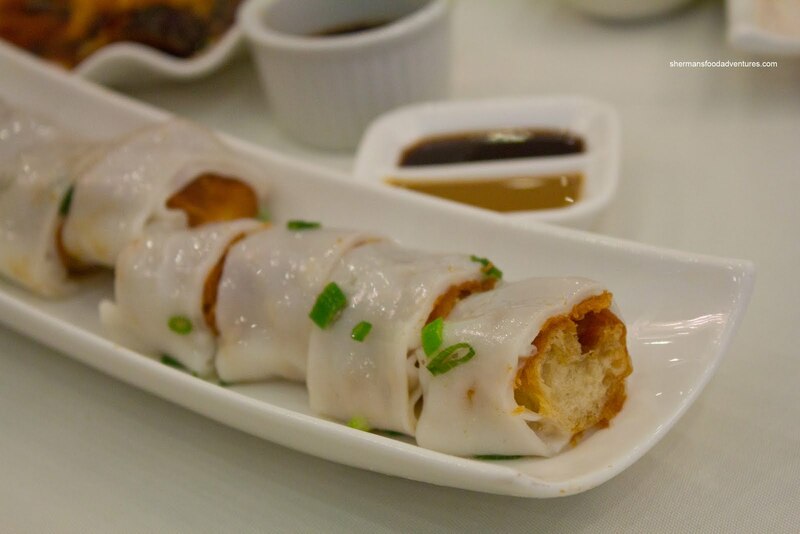 Normally, food expedition at Chinese restaurants are as random as a lineup at T&T Supermarket, yet they got it right here by serving us dessert last. And unlike many of the mediocre offerings, this was very good. The tart shell was flaky, airy and buttery (or lardy). The egg filling had a smooth texture and was only slightly too sweet. 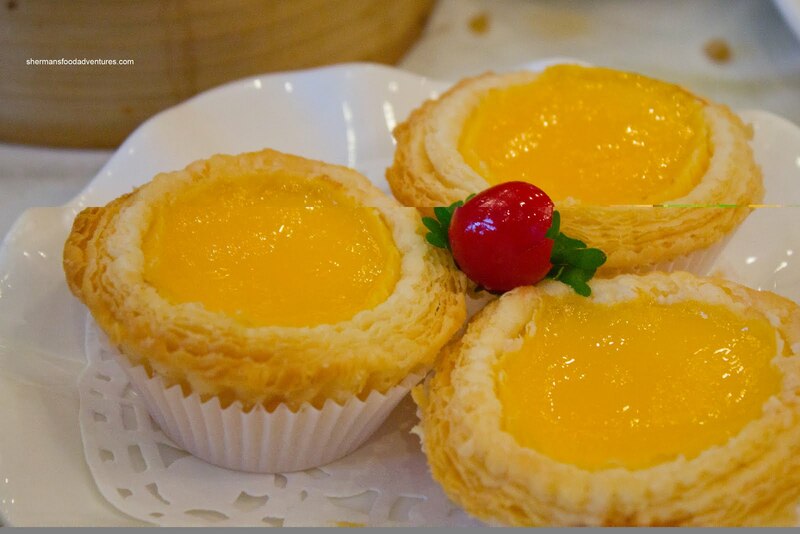 If I had to compare, this would be one of the better egg tarts I've had a dim sum service in awhile (probably on par with the ones we had at Phoenix Garden). So our meal finished off on a good note which left a better taste in our mouths. On the other hand, the meal as a whole was unacceptable considering the price and the fact there are so many other good restaurants nearby. For the life of us, we couldn't understand why the place was so packed. Some of the dishes weren't very fresh and in fact, some where not served very hot either. Of course there is much worse Dim Sum out there, but everything is relative. In relation to its direct competitors which are only steps away, Empire would not be one of my choices.